V-Cut profiles open wide possibilities to produce intricate and often difficult to form on site details like light coves. The tendency to produce these in GRG is not only wasteful but also expensive. These recessed indirect light features would normally be formed with expensive moulded materials but V-Cut coves are produced from standard plasterboard eliminating a mix and match style. Create an homogenous illumination without shading. A perfect partner to V-Cut’s coves. We produce a range of standard pre-made luminaires with or without incorporated LED lights. This is in addition to our project solutions for recessed light coves or “top hat” recesses. 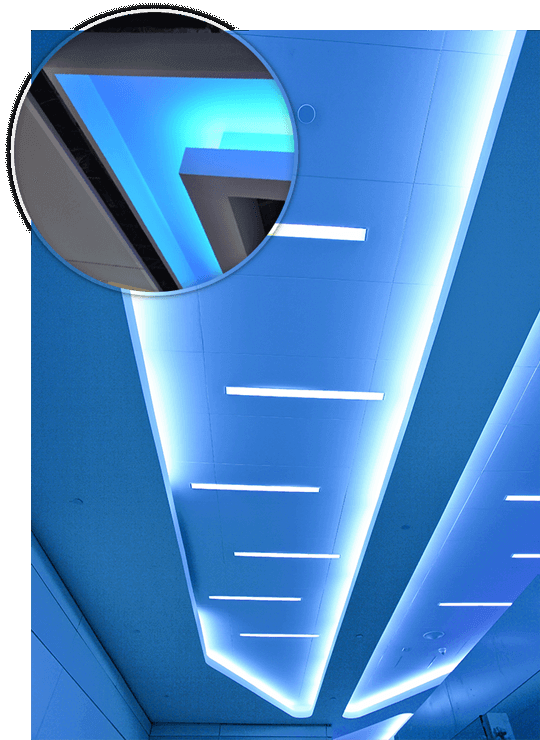 Type 1 – a recessed trough complete with LED light strips bleeding intense light from a 25mm wide factory machined slot in the wall or ceiling boards. The slot has chamfered edges which produce a cross pattern when it transverses from the ceiling to the wall. Type 2 – a plaster in visible slot light just 12.5mm thick deep x 20mm wide to create stunning patterns in a ceiling or wall. The luminaire is an extrusion complete with LED strip and diffuser cover which snaps into a bead section fixed into a cut in the plasterboard – all no deeper than the plasterboard making it ideal for post fixing. Linear intersecting lines can create patterns of light in the ceiling or wall fulfilling the designer’s artistic flair. Light that is invisible until switched on. Silent light is a panel system pre finished with an acoustic facing material that hides the built in LED lights. White or colour changing LED lights can be incorporated. The panels are suitable for walls and ceilings. Linear or curving patterns can be built in. An LED light recessed into a factory formed plasterboard cube to create a cool and more intimate feeling to the light direction. The Kewb can be installed into the ceiling or with up and down lights as a surface mounted feature on a wall or into a recess of a wall. © 2019 VCut Limited. All Rights Reserved.